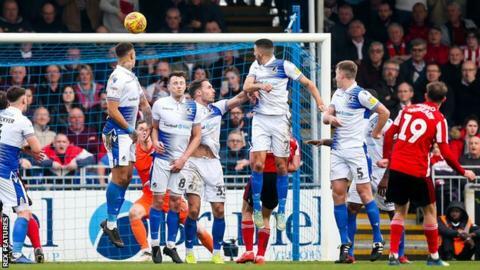 Aiden McGeady netted a fine free-kick as Sunderland boosted their chase for automatic promotion with a League One win at Bristol Rovers. The visitors took a 25th-minute lead when McGeady's cross from the right reached Will Grigg at the far post and his volley across goal was turned in from close range by Luke O'Nien. McGeady made the points safe on 55 minutes, finding the top corner with a perfectly-struck shot from a central position just outside the box after Liam Sercombe had been penalised for handball. Neither side could create much in a first half that saw Alex Rodman, Gavin Reilly and Ollie Clarke fire wide for Rovers from outside the box. Sunderland's defence, in which Tom Flanagan and Jimmy Dunne excelled, coped comfortably with some predictable attacks from their hosts and substitute Charlie Wyke missed a trio of late chances to extend the lead. The result saw Rovers slip back into the relegation zone and on this form, they face a huge battle for survival.